Athens, GA (Sept 8, 2007) - For viewers of Southeastern Conference Football on Lincoln Financial Sports (formerly Jefferson-Pilot Sports) for the past twelve years, there has been one constant. 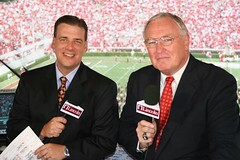 That constant was former All-Pro Defensive Tackle Dave Rowe in the Color Analyst seat (Pictured left with Dave Neal from a 2006 game). Rowe has been recovering from complications from rotator cuff surgery this past April, and decided to retire from his role in the broadcast booth. For the first time in 44 years, Rowe will not be working on a fall weekend. Rowe played college football at Penn State, joining the Nittany Lions the same year as Joe Paterno. Starting as Defensive Tackle for the 1977 Super Bowl XI Champion Oakland Raiders, Rowe played in the National Football League for 13 years. He retired in 1980, moving into the broadcast booth. He spent 10 years with NBC Sports before joining Jefferson-Pilot Sports on 1995. Dave Neal, who has partnered with Rowe since the 1999 season, said "Working with Dave over the past 8 years has been a privilege and an honor. While college football has become a big business to many over the years, Dave's love for the game never wavered. The ‘big fella’ and I covered over 100 games together and I enjoyed each and every one of them. I just hope a little of his energy and enthusiasm will be left in the booth this season." Taking over for Rowe as color analyst is former NFL and Canadian Football League (CFL) quarterback Dave Archer. Archer is currently the radio color analyst for the Atlanta Falcons radio network. Editorial Note: I have worked with Dave in the booth as stage manager for games played and broadcast from the University of Georgia since 1995, and on the SEC Championship Preview Show for the past three years. I can honestly say he is one of the most genuine, honest, and friendly people I have worked with in TV sports for the last 25 years. I will miss him for sure. Photograph Copyright 2006 by Christopher Byrne. All Rights reserved.